The Earth's Moon had a rough start in life. Formed from a chunk of the Earth that was lopped off during a planetary collision, it spent its early years covered by a roiling global ocean of molten magma before cooling and forming the serene surface we know today. A research team led by The University of Texas at Austin Jackson School of Geosciences took to the lab to recreate the magmatic melt that once formed the lunar surface and uncovered new insights on how the modern moonscape came to be. Their study shows that the Moon's crust initially formed from rock floating to the surface of the magma ocean and cooling. However, the team also found that one of the great mysteries of the lunar body's formation - how it could develop a crust composed of just one mineral - cannot be explained by the initial crust formation and must have been the result of some secondary event. The results were published on Nov. 21 in the Journal for Geophysical Research: Planets. "It's fascinating to me that there could be a body as big as the Moon that was completely molten," said Nick Dygert, an assistant professor at the University of Tennessee, Knoxville who led the research while a postdoctoral researcher in the Jackson School's Department of Geological Sciences. "That we can run these simple experiments, in these tiny little capsules here on Earth and make first order predictions about how such a large body would have evolved is one of the really exciting things about mineral physics." Large portions of the Moon's crust are made up of 98 percent plagioclase--a type of mineral. According to prevailing theory, which the study calls into question, the purity is due to plagioclase floating to the surface of the magma ocean over hundreds of millions of years and solidifying into the Moon's crust. This theory hinges on the magma ocean having a specific viscosity, a term related to the magma's "gooiness," that would allow plagioclase to separate from other dense minerals it crystallized with and rise to the top. Dygert decided to test the plausibility of this theory by measuring the viscosity of lunar magma directly. 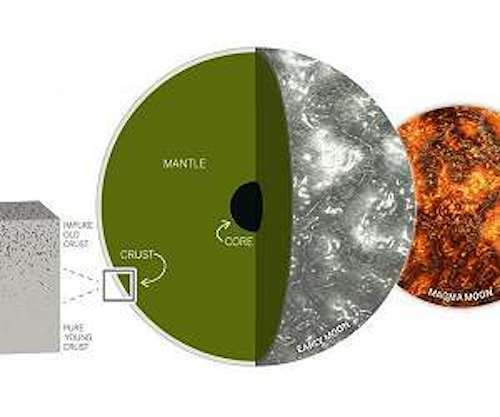 The feat involved recreating the molten material in the lab by flash melting mineral powders in Moon-like proportions in a high pressure apparatus at a synchrotron facility, a machine that shoots out a concentrated beam of high energy X-rays, and then measuring the time it took for a melt-resistant sphere to sink through the magma. "Previously, there had not been any laboratory data to support models," said Lin. "So this is really the first time we have reliable laboratory experimental results to understand how the Moon's crust and interior formed." The experiment found that the magma melt had a very low viscosity, somewhere between that of olive oil and corn syrup at room temperature, a value that would have supported plagioclase flotation. However, it would have also led to mixing of plagioclase with the magma, a process that would trap other minerals in between the plagioclase crystals, creating an impure crust on the lunar surface. Because satellite-based investigations demonstrate that a significant portion of the crust on the Moon's surface is pure, a secondary process must have resurfaced the Moon, exposing a deeper, younger, purer layer of flotation crust. Dygert said the results support a "crustal overturn" on the lunar surface where the old mixed crust was replaced with young, buoyant, hot deposits of pure plagioclase. The older cruse could have also been eroded away by asteroids slamming into the Moon's surface. Dygert said the study's results exemplify how small-scale experiments can lead to large-scale understanding of geological processes that build planetary bodies in our solar system and others. "I view the Moon as a planetary lab," Dygert said. "It's so small that it cooled quickly, and there's no atmosphere or plate tectonics to wipe out the earliest processes of planetary evolution. The concepts described here could be applicable to just about any planet."